FANgirl’s Note: One of the things I have observed over the years from storytellers I respect – George Lucas, Joss Whedon, Jane Espenson, J.J. Abrams, Dave Filoni, Gail Simone, Aaron Allston, to name a few – is that they can easily and quickly distill why certain storytelling elements work. They understand the mechanics and intricacies of the craft and use them to their advantage. Great storytellers also are able to use existing bodies of work to explain what they are trying to do with their own creation. The Seeking Strong Female Heroines and Heroine’s Journey series have been part of the journey at this blog to understand specific elements, and in the process turn them back around into our own storytelling. There’s easily a book’s worth of posts about the adventures of creating my own Heroine’s Journey within Wynde. Hopefully, my trusty editor will get a chance to write a couple of those. Last month, BJ’s post The Heroine’s Journey: How Campbell’s Model Doesn’t Fit was acquired for inclusion in an upcoming college composition textbook, The Bedford Book of Genres from Bedford/St. Martin’s. An academic in real life with impressive credentials and coursework in literature and philosophy, it’s been a privilege to have his insights. His observations on The Legend of Korra reveal that the writers deliberately weaved in elements of the classic Campbellian model but then modernized it to create a captivating heroine – with parallel Calls to Adventure, no less. Congrats, BJ, on becoming published as a geek academic, too! Back in April 2012, Nickelodeon premiered the animated series The Legend of Korra with great success. With a teenaged girl as the lead protagonist and coming a few weeks after the blockbuster opening of The Hunger Games in movie theaters, comparisons between Katniss Everdeen and Korra were inevitable. Fortunately the comparisons were also favorable. Previously we discussed Katniss as a strong female heroine who experiences a mythic character arc over the course of her story. Korra is the perfect complement to continue the Heroine’s Journey series. In the world of The Last Airbender and The Legend of Korra, the Avatar is a uniquely powerful individual capable of bending all four elements, not just one. 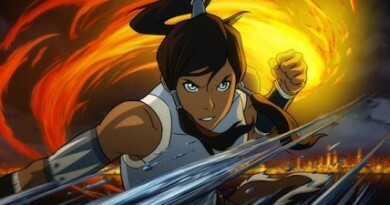 As the teenaged Avatar-in-training, Korra’s strength as a bender is inherent to her existence. The scope of her power is showcased in a number of visible instances, such as when she easily trounces three bender goons shaking down a shopkeeper, singlehandedly knocks out the three members of the opposing team to win a pro bending match, and nearly defeats an older and more experienced bender, Tarrlok, until he unleashes his bloodbending. If this were the only side to Korra’s strength, her character would not be particularly distinctive or interesting. Fortunately, the series emphasizes another form of strength, as well. Korra is equally emotionally strong. From the opening episode, her persistence in the face of adversity is a recurring theme. She refuses to take no for an answer and stands up to authority figures when she believes she’s right. When the Fire Ferrets are on the verge of elimination, she insists they not give up on the match – leading another fierce woman, Chief Beifong, to be impressed enough to tell Tenzin “she’s tough as nails.” She fears Amon’s power to strip benders of their bending, but publicly challenges him to a duel anyway. She stands up to Councilman Tarrlok repeatedly, including confronting him in his office after hours. She also has the courage to stick to her confidence that Hiroshi Sato is in league with the Equalists, even at the cost of a (temporary) schism with her friends. Like any hero Korra has her moments of fear and self-doubt, but she pushes them aside and continues forward with her duty. Korra is drawn as a matured female teenager, and the series ensures that her characterization includes actions and motivations that ring true for a young woman. Unlike the egos typical of teenage male characters, Korra does not hesitate to apologize for her mistakes or to cry in front of her mentor when she’s afraid. She is immediately fascinated by the revelation of a past romance between Tenzin and Lin Beifong, pressing for details the older man has no interest in sharing. Compassion is one of her core traits, such as showing sympathy for Mako’s family tragedy, empathy to the formerly arrogant Tahno after he’s been stripped of his bending by Amon, and offering shelter in the Air Temple to Asami, Mako, and Bolin after Hiroshi’s betrayal is revealed. Similar to Katniss Everdeen, one of Korra’s primary motivations is to protect others, including Republic City from the Equalist threat and the innocent non-benders from Tarrlok’s tyranny. In the final showdown, Korra first makes sure that Tenzin’s family has escaped before leaving to face Amon, and it is her desperation to protect Mako that finally unlocks her airbending. Taken together, these traits help to make Korra a heroic character whose personality is as female as her physique. Finally, Korra is portrayed as an unequivocally heroic character. Her status as the Avatar gives her an innate Chosen One role, and she specifically declares that “it’s my duty to help people.” She joins Tarrlok’s task force to help protect Republic City. She pursues Amon after the attack on the pro bending arena despite being greatly outnumbered. When Tarrlok demands her obedience in exchange for releasing her friends from their unjust imprisonment, she refuses the deal because she knows it’s wrong. She unleashes her waterbending talents to join Iroh’s fleet in fighting Sato’s biplanes. Along the way Korra makes her share of mistakes, of course, like running off to Republic City without bringing any money or fighting off the thugs without a thought for how the police will react to her vigilantism. But in an era of anti-heroes and grimdark stories, Korra is not motivated by rage, revenge, hatred, or other dark or selfish emotions. In Book One’s climax, Korra realizes she cannot beat Amon in direct combat, but can take away his influence by exposing the truth about him. When she faces Amon in combat she knows he will strip her of her bending if she loses – which comes to pass when Amon’s bloodbending overpowers her. Yet Korra willingly takes that risk and makes that sacrifice, and as the spirit of Aang later tells her, it brings her to the “lowest point” where she becomes open to the “great change” that unlocks her airbending power and ultimately the true scope of her powers as the Avatar. By remaining true to her values no matter the challenges thrown at her, Korra is a heroine we can root for. Korra’s character arc in Book One follows many of the recognizable beats of a mythic Heroine’s Journey, departing from Joseph Cambell’s model for the Hero’s Journey in several key areas where the journeys of female protagonists frequently differ. In fact, Korra experiences her journey on two levels simultaneously: her spiritual path to unlocking airbending and becoming a fully fledged Avatar, and her heroic path to defeating Amon and the Equalist threat to the stability and peace of Republic City. In many respects, Korra’s journey parallels the classic Campbellian model. Her first call to adventure comes when Tenzin arrives to tell her that he cannot stay to train her because his political leadership is needed in Republic City. Korra responds by sneaking her way to Republic City and defeating the goons on her first day there. She faces a setback up on her arrest, however, and nearly agrees to go back home before ultimately convincing Tenzin that the city needs its Avatar. Similarly, Korra’s second call to adventure occurs when Tarrlok invites her to join his anti-Equalist task force. She initially declines, emphasizing her need to focus on her Avatar training first, but finds herself politically outmaneuvered into changing her mind by the Councilman. Interestingly, both of these reversals end with a press conference with reporters: to announce that the Avatar is staying in Republic City and that she is joining the task force to help defeat Amon, respectively. In other ways, however, Korra’s story relies upon elements of a distinctively Heroine’s Journey different from Campbell’s framework. In the Hero’s Journey, the hero typically relies upon a single mentor. 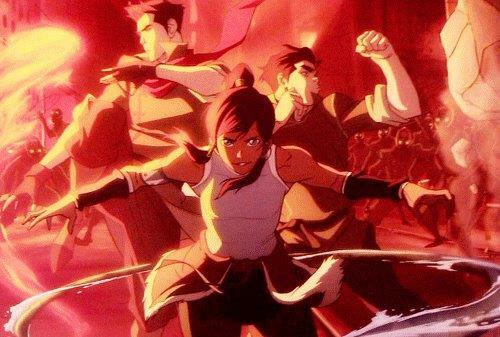 Like Katniss and Buffy in the Buffy the Vampire Slayer, Korra forms a group of allies – a peer group consisting of Mako, Bolin, and Asami, in addition to her airbending mentor Tenzin and her loyal polar bear dog steed Naga – who work collectively to support her objectives. At one point, the group is even expressly called “Team Avatar” in dialogue. Similarly, in the Hero’s Journey love is seen as a temptation that threatens to distract the hero from completing his quest. In the Heroine’s Journey, by contrast, romantic love often strengths the heroine rather than weakening her. Although Korra and Asami are briefly the subjects of Mako’s divided affections, Korra does not let her attractions or jealousy interfere with her progress. She continues to compete with the Fire Ferrets, for example, and offers Asami refuge at the Air Temple even in a moment when she believes Mako has chosen Asami over her. Korra’s feelings for Mako do not prevent her from pursuing her goal of defeating Amon, but instead lead the two of them to chase after her nemesis together. Some of the challenges that Korra faces are well suited to a Heroine’s Journey, as well. She faces emotional conflict over how to balance competing pressures in her life. She struggles with the traditional airbending lessons offered by Tenzin – even shouting “maybe you’re a terrible teacher!” at one point – and it is her rebellious participation in pro bending that finally teaches her how to “be the leaf” to move within the air. Similarly, despite the danger to all benders posed by the Equalists, Korra insists upon taking a leave of absence from Tarrlok’s task force so that she does not let down Mako and Bolin, who need her as a teammate in the pro bending championships. Korra also rejects the rules set down for her by others, such as continuing with pro bending despite Tenzin’s direct order to the contrary and refusing to rejoin Tarrlok’s task force in response to his increasing political extremism. 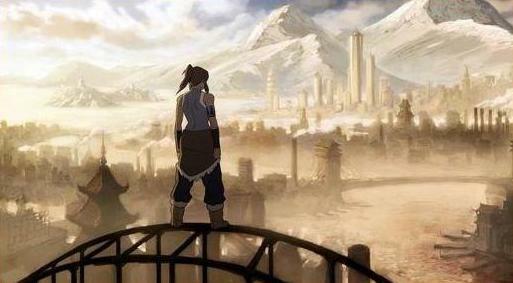 By the later stages of her journey, Korra begins to make peace with the way she has struck the balance in her life. She reconciles with Tenzin as a teacher and Asami as a friend an ally. When the initial battle against Amon’s forces and Sato’s technology has gone poorly, Korra reins in her compulsion to continue the fight and has the strength to remain patient, hiding out to wait for Iroh’s reinforcements to arrive. When the two paths of her Heroine’s Journey reach their climax at the end of Book One, Korra makes her own choices to decide her destiny. Korra is the one who figures out the strategy of exposing Amon as a bender rather than waging a frontal assault. 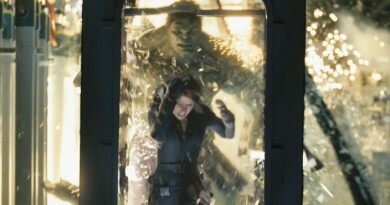 When he flees, she is willing to pursue him alone – and then accepts Mako’s offer to join her. She confronts Amon despite having no counter to his bloodbending power, and bears the consequence when he strips her of her bending. 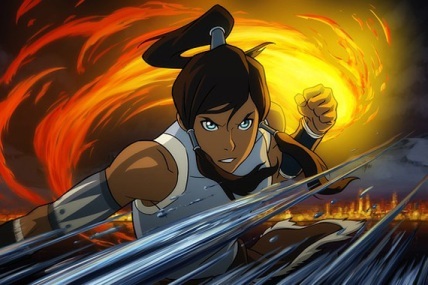 After Amon’s defeat, she accepts Katara’s attempt to heal her before finally opening herself to her grief alone at the cliff – when a vision of Aang appears to her and reveals that her actions in fact are worthy of the Avatar, finally unlocking her full potential and restoring her power to bend all four elements. Book One ends with Korra’s first use of the Avatar state: restoring the bending abilities of her allies who had been stripped by Amon. 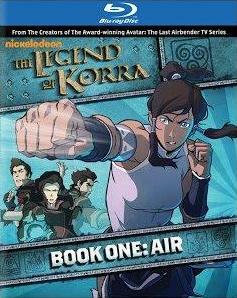 The Legend of Korra Book One: Air is available on DVD and Blu-ray now. Book Two: Spirits premieres on Nickelodeon in September. 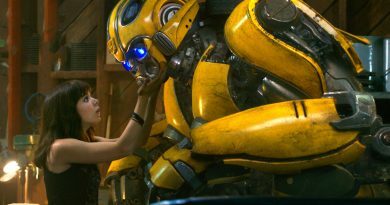 The trailer was unveiled at San Diego Comic-Con earlier this month. If Book One is any indication, Korra has more great moments as a strong female heroine, and further progression of her Heroine’s Journey, in the episodes ahead.